1Password continues its gradual improvement in ease of use. 1Password 7 for Mac has a variety of small improvements and a fresher design that add up to a nice bump justifying the version number. But because its maker, AgileBits, switched to a subscription model as its dominant method of offering software, the company is clearly less obsessed with including the kitchen sink, as it tries to offer ongoing updates and new features between major releases to justify the cost to current subscribers. And that’s fine: a rush to cram features—some half-baked—into new versions of software where developers rely heavily on upgrade fees as part of their revenue cycle doesn’t benefit users. A cleaner and crisper display organizes your passwords and other information for quick access and higher legibility. 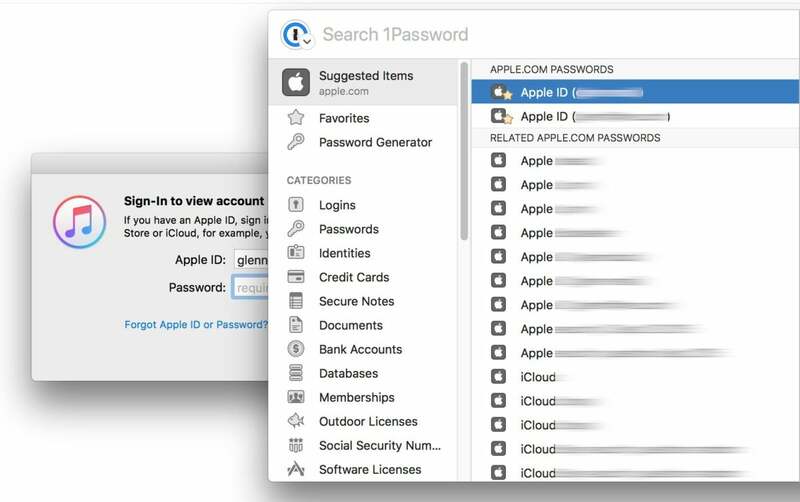 1Password provides a secure, central place to store your password and account information, generate new strong passwords uniquely for every site and service, and retrieve or fill them into websites and apps. You can also store bank accounts, credit cards, licenses (of the software and fishing variety), secure notes, file attachments, and other bits and pieces. The app also handles time-based one-time passwords (TOTPs) used as second factors for some sites and ecosystems. The latest version adds more support for inserting your account login within native apps, as opposed to via plug-ins for Chrome, Firefox, and Safari. Instead of copying, you can just drag and drop items from 1Password into the app’s login fields. That’s a nice update, but what’s better is that 1Password can detect if an app is presenting a password dialog, and shows only entries for that app or by that software developer by name at the top of the list of potential items to fill. Bring up 1Password mini while viewing a login dialog, and it shows passwords appropriate to the app and company. 1Password organizes your passwords into vaults, each of which can have a unique password. Because of how strong the algorithm is for locking the password, even having an archive stolen would be of no utility to the thief. You can have just a single vault, or many, depending on how you want to compartmentalize, and with whom you want to share some of your secrets. 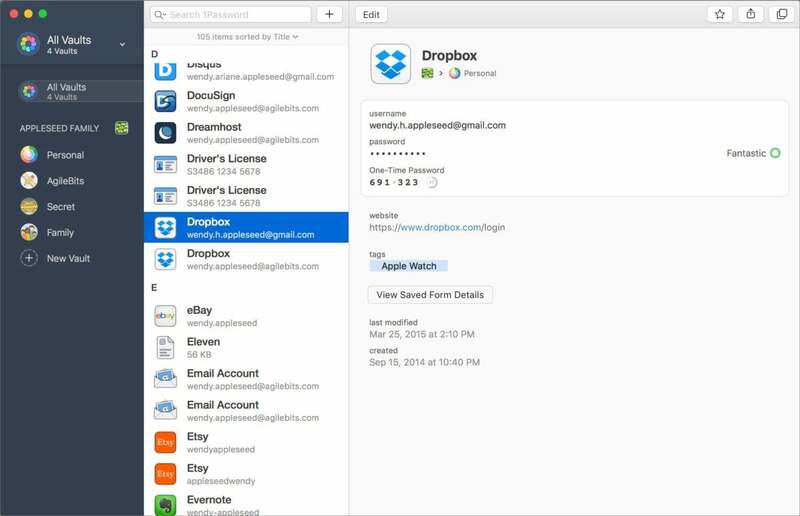 Version 7 for Mac improves the presentation of multiple vaults in the 1Password interface, and gives you better access to switch vaults, as well as move or copy entries among them using drag and drop. 1Password 7 makes it easier to navigative among multiple vaults, including moving and copying items. 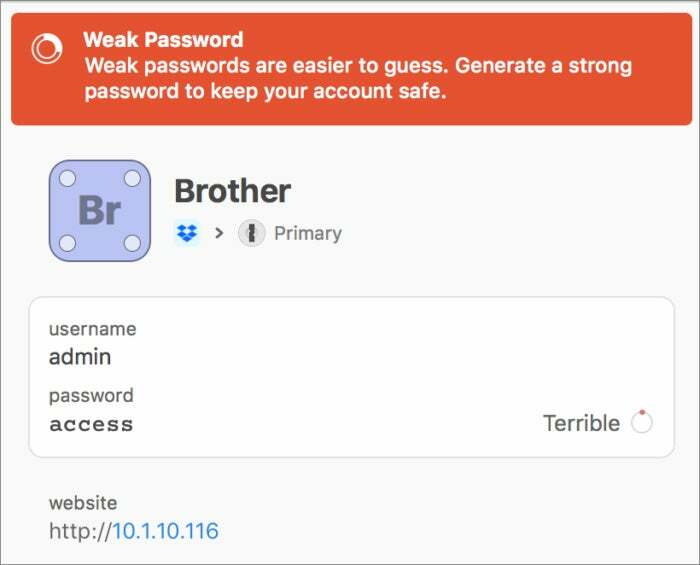 AgileBits started to integrate password warnings into 1Password a few versions ago, and in this release, it lets you tap into haveibeenpwned.com, a site run by Australian security researcher Troy Hunt. When account data gets released into the wild from site and service breaches, Hunt incorporates the list of email addresses into his unfortunately increasingly massive database. By opting in to check his list in 1Password, you can see at a glance which of your accounts by site are listed at his service. There’s no cost for this. You can also sign up at haveibeenpwned.com to receive email notification of future breaches, which I recommend, but it’s great to have that correlated to your 1Password entries at a glance. The most noticeable thing about version 7 is the crisper interface—it’s also the least important, as the previous approach was just fine. But as part of the ongoing evolution of macOS apps that’s taken years to walk fully away from the skeuomorphic approach that Apple once pursued, this new version has more subtle shades of colors, more refined uses of type, and more abstracted symbols than the previous release. For those who like typographic design elements, AgileBits licensed a custom version of a readable monospaced typeface, which it calls Courier Prime Bits. This is used wherever a password is shown. And when you create secure notes, you can now use the Markdown text-formatting language to set the appearance of items. AgileBits subscription offerings revolve around 1Password.com, an optional way to sync passwords with centrally hosted vaults for which the company possesses none of the secrets necessary to unlock. With an individual, family, team, business, or enterprise license, you or a set of users can install 1Password across platforms. With an individual subscription, a license includes access to iOS, Android, Windows, and macOS apps for the same set of vaults on an unlimited number of devices. For multi-seat subscriptions, each user can access their own vaults across multiple plaforms and have shared vaults, as well as account recovery capabilities for others. How rude! But this password is truly terrible, as 1Password notes. Using 1Password.com lets you access passwords through a web browser as well as the apps, and AgileBits performs all the encryption and decryption the browser—it still doesn’t have access to your keys. However, even with a subscription there’s no requirement to use 1Password.com for storage. You can store nothing at all there, and just use local vaults that are synced among your devices. The latest version of the app retains syncing vaults using iCloud (just a single vault plus macOS and iOS only), Dropbox, a local wireless local area network (WLAN) server, or via a local folder. 1Password.com subscriptions start at $2.99 a month for an individual license. However, AgileBits also sells a standalone version of 1Password with version 7, which is $50 at introduction and $65 at some indeterminate point in the future. Everyone should use a password manager, because there’s no safety in re-using passwords across sites and services, nor in using passwords that are too short and weak to prevent cracking should the seeming inevitable occur, and the password database is breached. 1Password continues its gradual improvement in ease of use, especially with the addition of app-based password matching and drag and drop entry. Improving its display of potentially compromised passwords is a great help for users in consolidating a security review as well.